All artwork and exhibits below are accessible to ticketed passengers only, located past security checkpoints in the Barbara Jordan Terminal. Click on each image icon to read more. 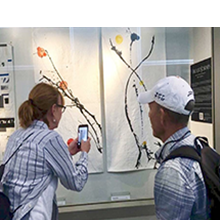 ABIA's Changing Exhibits program features a rotating schedule of art, history, or cultural displays curated for local, national, and international travelers.